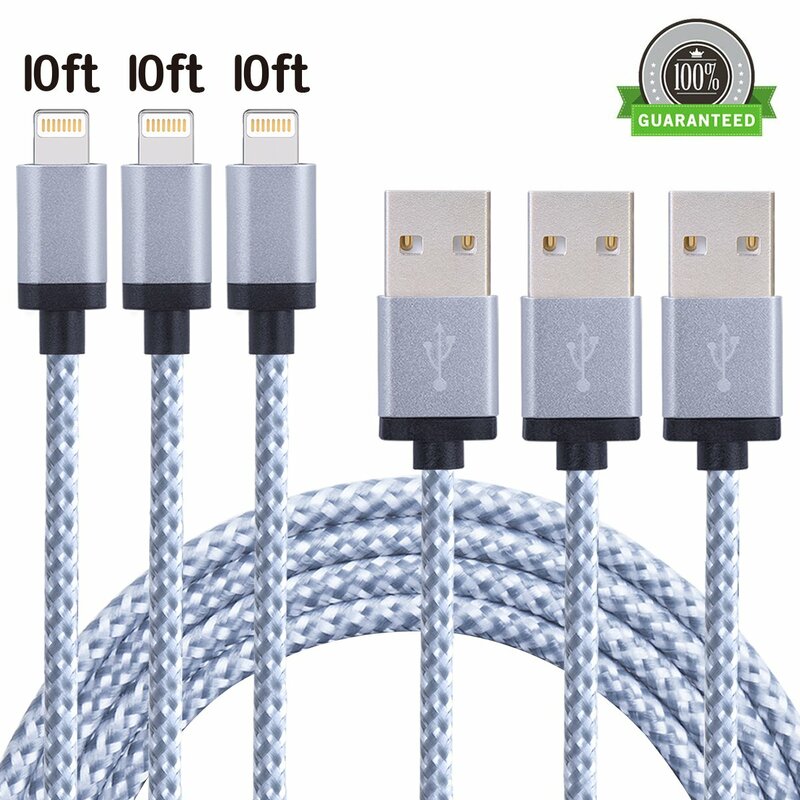 Home › Electronics › Amoner Lightning Cable 3Pack 10 Ft Iphone Charger Cord Nylon Braided For Appl..
Amoner Lightning Cable 3Pack 10 Ft Iphone Charger Cord Nylon Braided For Appl..
HIGH PERFORMANCE: Sync and Charge simultaneously at the fastest speeds on your lightning devices. 100% Guaranteed for making great performance to ensure you and your devices safe. NYLON-SERIES: Tangle-free nylon braided cord with aluminum connector has a 4000+ bend lifespan, and comes to be more flexible than other normal cables. UNIVERSAL COMPATIBILITY: Apply to all devices with lightning ports. Sync and charge well with New iPhone 7, iPhone 7 Plus, iPhone 5 ,5C ,5S, iPhone 6, 6 Plus, iPhone 6s, iPhone 6s Plus, iPhone SE, iPad Air, Air 2, Mini, Mini 2, Mini 3, Mini 4, iPad 4, iPod 5,and iPod 7. Compatible with the latest iOS10. WHAT YOU GET: 3 X 10FT Classic Style Nylon Braided Lightning Cables. 10FT extra length, over twice as long as the cables that come with your Apple device, brings you the greatest convenience when charging from the wall socket or car charger far away. Color: 3Pack 10FT Policy Warranty Enjoy perfect replacements or refund within ONE YEAR. BUT BEWARE of COUNTERFEITS: CHECK SELLER NAME BEFORE PURCHASING! AmonerPRODUCTS MUST BE SOLD by "Amoner - Fulfilled by Amazon" or "Amoner". WE HAVE NOT AUTHORIZED ANYONE TO RESELL OUR PRODUCTS. THE 12-MONTH WARRANTY ISONLY VALID WITH YOUR PURCHASE FROM AMONER AND NO ONE ELSE. Buy with Confidence Instead of plastics or Polycarbonate sheathing, this Amoner lightning cablefeatures a novelty high tensile nylon construction which is durable andsturdier than the normal lightning cable but also flexible and tangle-free. Premium copper wiring wrapped in the nylon jacket is much thicker than normalstandard quality cords and therefore will definitely guarantee fast charge andefficient sync. One package includes amazing 3 pack 10ft nylon fiber braided lightning cablesat such a reasonable price. You won't lose your money! Universal Compatibility Complete charge and sync compatibility with iPhone 7, iPhone 7 Plus, iPhone5, iPhone 5s, iPhone 5c, iPhone 6, iPhone 6 plus, iPhone 6s, iPhone 6s Plus,iPhone SE, iPad Pro, iPad Air, iPad Air 2, iPad mini, iPad mini 2, iPad mini 3, iPadmini 4, iPad 4, iPod Touch (5 Gen), iPod Nano 7, Compatible with the latest iOS10 without any error message. Warning Tips: The power output of USB charger (charger's head, wall plug...) shall not exceed 5 volts/2amps.